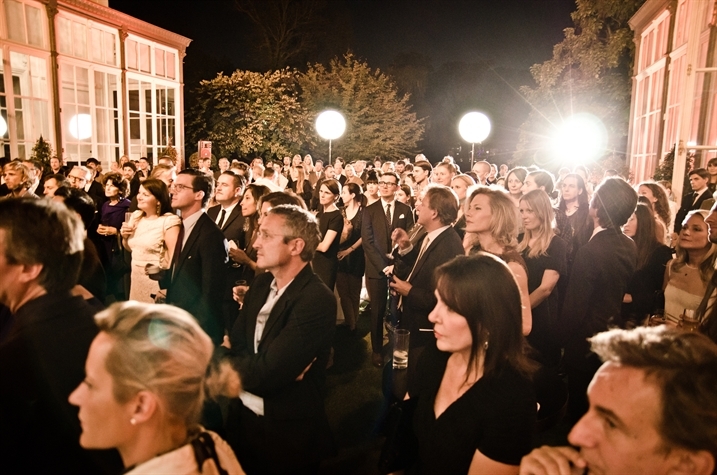 This past Thursday night I attended a British Fashion Council reception hosted by Sir Peter Westmacott (British Ambassador to France), Samantha Cameron (wife of the British Prime Minister David Cameron), and Harold Tillman CBE (Jaeger) to celebrate British fashion at the British Ambassador's Residence in Paris. 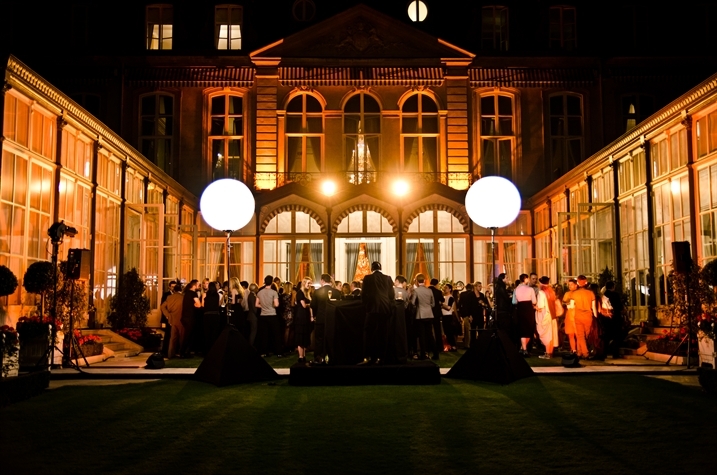 This event was one of the hottest invitations of the entire Paris Fashion Week calendar. What I'm Wearing: Satin trimmed dress, Chanel. Necklace and matching mother of pearl Alhambra earrings, Van Cleef & Arpels. Horsebit bag, Gucci. Swarovski butterfly peep toe heels, Aruna Seth. To say that the setting of the British Ambassador’s Residence on Rue du Faubourg Saint-Honore was spectacular and magical would be an understatement. Lanterns filled with candles lined both sides of a red carpet leading up to the front entrance, and once inside, the foyer was lit solely by the dancing light of dozens of Diptyque candles, providing the most amazing fragrance. The actual party was held in the back garden and servers were clad in white jackets. Having lived in NYC and now London, I like to think I mastered the art of feigned nonchalance when it comes to celebrity encounters, but this party had my head spinning. 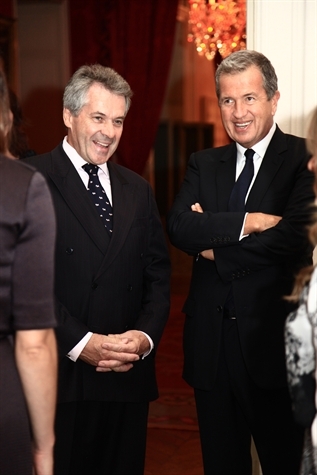 First I spied Mario Testino hitting up the nibbles. 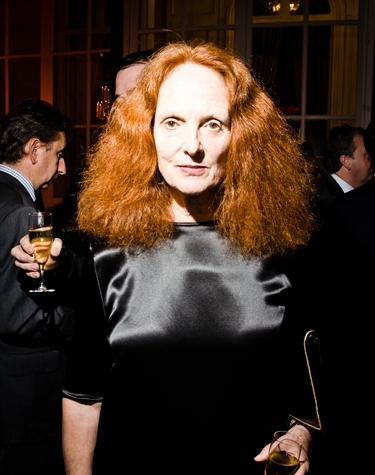 Then there was Glenda Bailey (Editor of Harpers Baazar), oh and Grace Coddington. 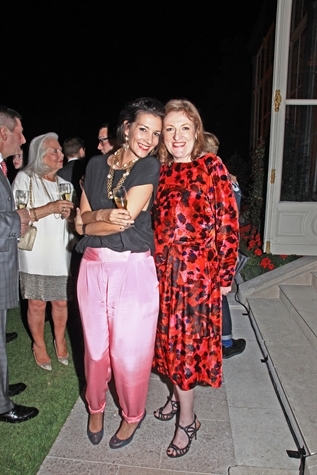 And then all of the designers and U.S. Press started walking in: Peter Pilotto, Nicholas Kirkwood, Erdem, Rupert Sanderson, Roland Mouret, Suzanne Clements and Inacio Ribeiro, Jonathan Saunders, Suzy Menkes (IHT), Christopher Kane, and the heads of Bergdorf’s and Neiman’s. And then the ultimate fashion moment happened and I LOST it: Anna Wintour walked in on the arm of Hamish Bowles. It was all just too much to process. First the setting, which would have been spectacular on its own, then the guest list and now Anna (insert expletive) Wintour!!! I was on fashion overload and that was the straw that broke the camel’s back. All I remember was repeating in my head, “You’re at a Paris Fashion Week party with Anna Wintour, ok calm down, breathe, she is only 4 feet away from you, act cool, this is normal.” And then I did the most rational thing I could think of in that moment, I pulled out my Blackberry and called my mom back home in Boston, and in a low whisper I said, “I’m standing next to Anna Wintour.” Ha, well we all need our mothers in "hard" times. This party was EPIC and goes down in the books under top five parties I've ever attended. I'm a lucky girl. I love this post , I think you love name necklace too ! !